This entry was posted in business, social, social-business and tagged 2014, business, connect, ibm, social. Bookmark the permalink. Stuart, I’m sure your predictions will come to fruition. I think IBM’s vision and product roadmap fits the market requirement in a unique way. I believe that one barrier to widespread adoption is that there are many suppliers offering products but which only offer a partial solution but IBM has a comprehensive portfolio. Seamless integration of these fragmented products is a must for any supplier and user as I expect there will be a move from BYOD to UAD (use any device) and the need for a layer of ‘gluecode’ to seamlesslessly integrate product and function across platforms will be paramount. At the moment too many disparate products exist with too many logins and we are almost risking returning to the days of duplicate data sets and their associated problems. Clearly IBM is leading the way with their capabilities in respect of ‘socialising’ the enterprise, and I fully support their vision of the scope and reach being throughout the organisation and up and down the supply chain. 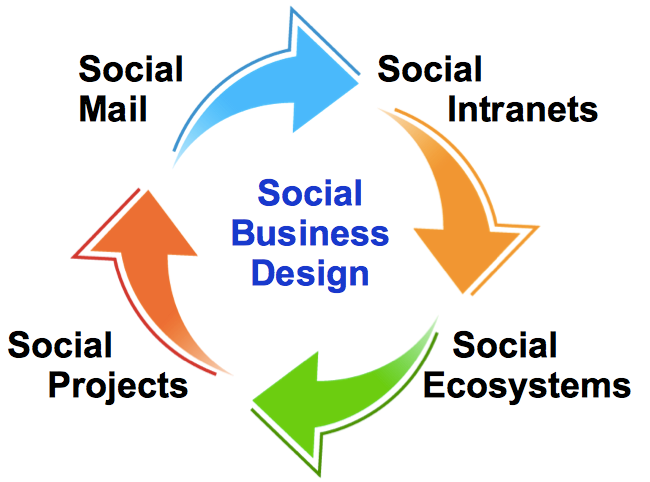 To become social an organisation has to re-think, re-invent and re-define its entire eco-system in terms of organisational structure and culture. Social Media has without doubt changed the consumer landscape and businesses will need to become socialised if they are to remain in the game. Let’s face it, those hierarchical structures, protected fiefdoms, control systems etc have been around virtually unchanged for generations, and they were principally designed to reflect a very different world, when it was perhaps important to limit/restrict communication and companies wanted employees to ‘follow the rules’; they didn’t want continuous change – and these structures were designed to enforce a policy of management by policy, ‘do as we say’. This does/did create a culture that indoctrinates a habitual repetitive behaviour, where ingrained thinking becomes acceptable that at the same time promotes a resistance to change or innovative thinking! Times have changed – and it’s time to change the organisation! !